The art historian WJT Mitchell argues that, ‘we need to grasp both sides of the paradox of the image: that it is alive—but also dead; powerful—but also weak; meaningful—but also meaningless.’ Lucy Skaer’s artistic practice addresses just such paradoxes, demanding our attentiveness to them. Her solo exhibition at the Fruitmarket is conceptually astute in this regard, but also markedly beautiful. It made a convincing case for the ambition and quality of her work, which requires, but certainly repays, careful attention. Skaer often engages in the mobilisation of images: they shift from one state to another, one medium to another, one code to another, as source material is pushed almost beyond recognition. The documentary and indexical status of press photographs, or the informative utility of maps and diagrams, are effaced by layering, by removing details, colouring, or by repetitive over-drawing, and thus approach abstraction. Artworks by Leonardo and Hokusai are similarly treated. I’m reminded of Foucault’s call to artists to abandon the austerity of pure modernism and instead ‘…put images into circulation, to convey them, disguise them, deform them, heat them red hot, freeze them, multiply them’. In Skaer’s work, points of equilibrium are found amidst this circulation; stillness is continually played off against mobility. The two-dimensional is frequently translated into the three-dimensional, and vice versa; for instance in small sculptures derived from rotating Rorschach blot images through 360 degrees. The blot itself is made by axial movement, and these works nicely materialise that process. While some are open like geodes, others remain sealed off from view, playing on the ambiguity of an image which is meant to reveal something about its interpreter rather than holding any secrets of its own. Two new multi-part installations are shown. 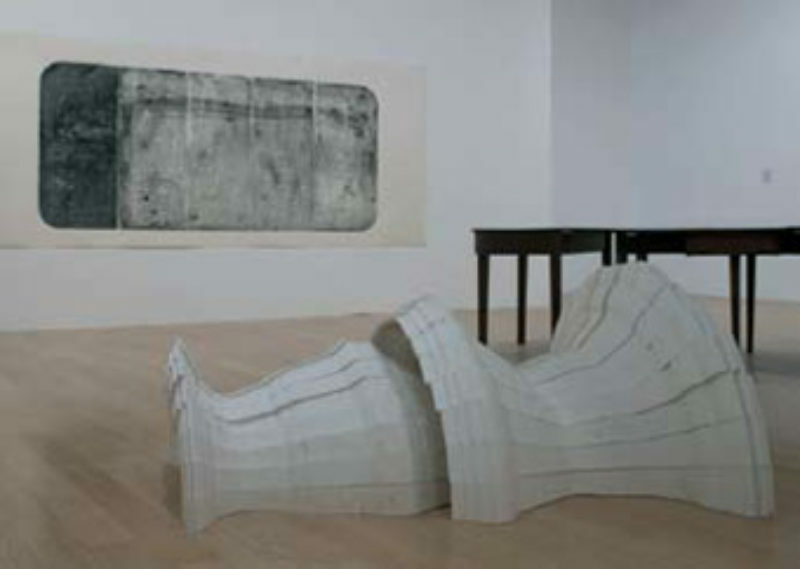 ‘Three Possible Edges’, 2008, places the viewer inside a triangular arrangement of three large overdrawn silkscreen collages, with mounted police, a whale skeleton, and a battleship (just) visible. ‘Room of Lines’, 2008, features five prints taken from a table-top, the table itself, and sculptures derived from medieval illustrations of the Danse Macabre—one of many intimations of death here. One of the highlights of this show is ‘Leonora’, 2007, which invokes the surrealist artist Leonora Carrington via an installation comprising a large drawing, ‘Death’, 2006, a short, looped film of Carrington herself, a small sculpture and a desk inlaid with mother-of-pearl. Here, someone living comes, paradoxically, to haunt the gallery, and a key issue is what notion of ‘death’ animates the work. Certainly it is not the grotesque or abject, but neither is it an unimaginable or ethereal beyond. Rather it seems to be an uncanny death-in-life which might refer more to moments of subjective failure or absence than to physical death per se. Skaer’s prolific work as a collaborator is represented by ‘Flash in the Metropolitan’, 2006, made with Rosalind Nashashibi. This film, in which several objects in the Metropolitan’s collection are briefly illuminated for a moving camera, is mesmerising—animating and estranging the objects, freeing them—if only briefly—from their museam piece fate and giving them an eerie power. Skaer’s stated aim of establishing an autonomy for her works beyond their source material implies that we should resist any notion that a ‘deep’ meaning lies under their exquisite surfaces. Quite so. But they nonetheless offer fresh perspective on such material, one that benefits from Skaer’s demonstration that our perception involves related moments of blindness and insight.